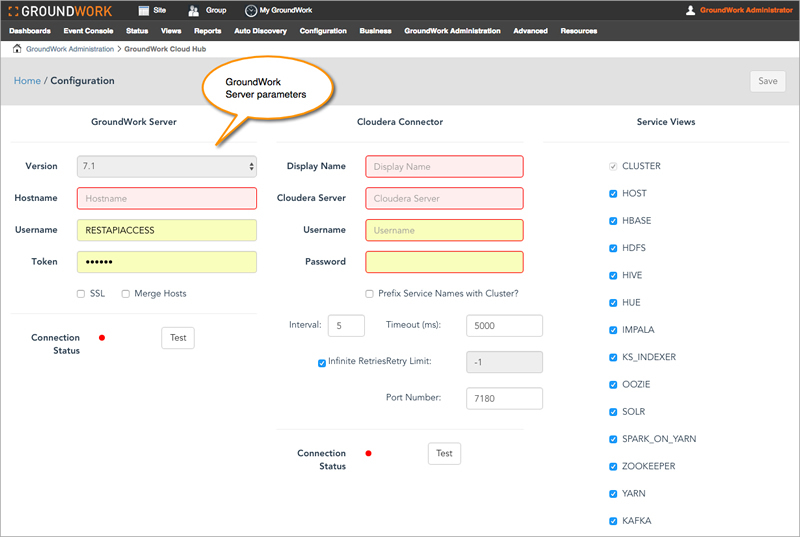 This page covers how to add and configure a Cloudera connection using GroundWork Cloud Hub. The connection requires a unique set of parameters (e.g., endpoint, credentials). You will need your GroundWork server and virtual environment connector parameters handy. The initial Cloud Hub screen is used to add, start, stop, modify, or delete available connectors. Follow the steps below to add a connection. You will need to create a new connection in this way for each region to be monitored. Log in to GroundWork Monitor as an Administrator. 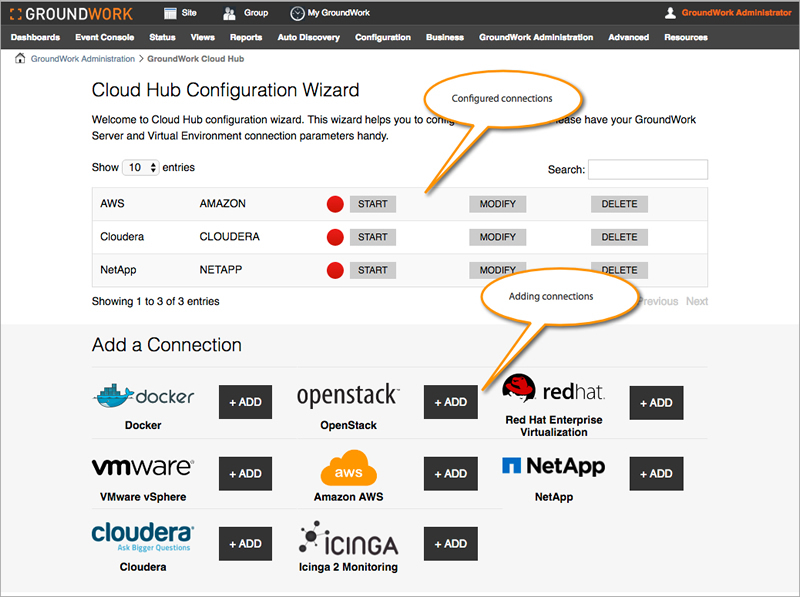 Select GroundWork Administration > GroundWork Cloud Hub. Click +Add corresponding to the Cloudera connector icon. In the configuration page you will need to enter both the GroundWork server and remote server parameters. The data the GroundWork server receives comes from the remote virtualization server. The information is pulled from the API on a periodic basis based on the check interval that is set. The Groundwork server is where CloudHub will store Cloudera metrics. Often, this is the same server as where CloudHub is running. However, CloudHub can also be run in a distributed environment, on its own node in a Groundwork cluster. Here we enter the GroundWork server parameters, each described in the table below. Version The Groundwork server version number. Usually you cannot change this value, and it will default to latest release installed. 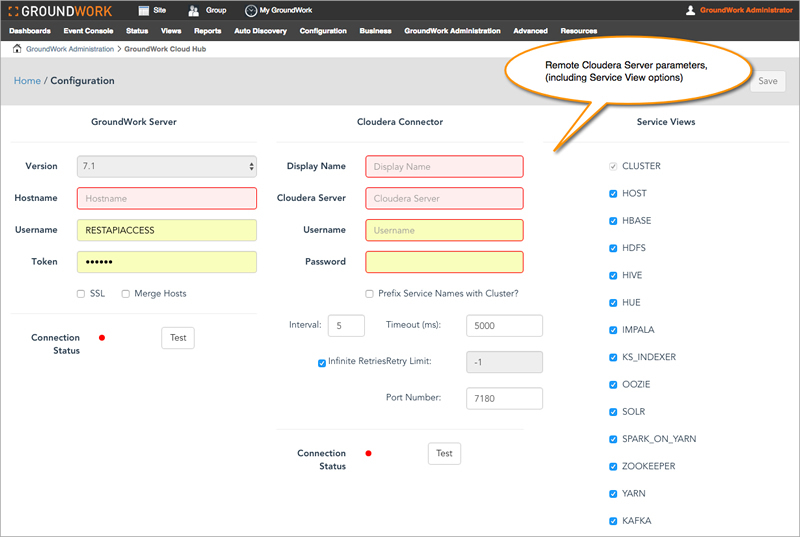 CloudHub can be configured to talk to versions going back to 7.0. CloudHub auto-detects which versions are available. Hostname The host name or IP address where a Groundwork server is running. A port number should not be entered here. If Groundwork is running on the same server, you can enter localhost. Username The provisioned Username granted API access on the GroundWork server. Token The corresponding API Token (password) for the given Username on the GroundWork server. SSL Check the SSL checkbox if your GroundWork server is provisioned with a secure HTTPS transport. Merge Hosts If checked, this option combines all metrics of same named hosts under one host. For example, if there is a Nagios configured host named demo1 and a Cloud Hub discovered host named demo1, the services for both configured and discovered hosts will be combined under the hostname demo1 (case-sensitive). Test/Connection Status After entering the GroundWork server parameters, click the Test button to test the connection. A dialog will be displayed with either a success message or, if the server cannot be contacted, an error message will be displayed with information describing why the connection failed. When a successful connection is made, the Connection Status button will change to green. Here we enter values for the remote Cloudera server, each described in the table below. Display Name This is the configuration’s name displayed in the list of Cloud Hub connectors on the Cloud Hub home page. Cloudera Server The host name or IP address where a Cloudera server is running. A port number should not be entered here. Username The provisioned Username granted API access on the Cloudera server. Password The corresponding Password for the given Username on the Cloudera server. Prefix Service Names with Cluster? A Cluster is a logical entity that contains a set of hosts and the service instances running on the hosts. If this directive is checked, the name of the service will be prefixed with the name of the cluster in the various GroundWork monitoring visualizations. This option is useful when are running two or more Cloudera clusters. 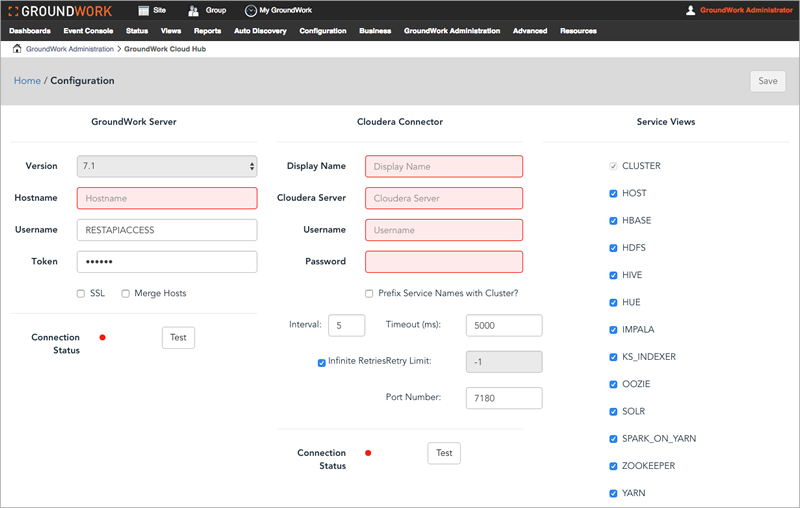 Without this option checked, Cloudera services are stored as hosts with a host name directly corresponding to the Cloudera service name. For example, the HDFS service is stored in GroundWork as a host named hdfs. If this box is checked, the hostname will be prefixed by the name of the cluster it is running under. Given a cluster named cluster1, the hostname for HDFS will be stored as cluster1-hdfs. Similarly, the SOLR service will be stored as a hostname cluster1-solr. The default setting is set as disable. If you find Cloudera services are not being mapped to unique GroundWork hostnames, you can use this feature even with a single-cluster Cloudera deployment. Interval This is the metric gathering interval for collecting monitoring data from Cloudera and sending it to the GroundWork server. The value is in minutes. Timeout (ms) The connection timeout in milliseconds. Normally the default value 5000 is sufficient. When you have a slow network connection, you may want to increase the default value. Infinite Retries Check this box if you want CloudHub to infinitely retry connection to Cloudera when the connection fails. When this box is checked, the Retry Limit field is disabled. When this box is unchecked, the Retry Limit field is enabled. Retry Limit This entry is the number of retries for the connection and sets a limit on how many attempts are made after a failure. The number set indicates how many connections are attempted before the connection is left in an inactive state. At this point, the connection is suspended and you will need to manually restart it. When a retry limit is exhausted, all hosts managed by this connection are set to the monitor status Unreachable and all services for the matched hosts are set to the status of Unknown. Port Number The optional port number for the Cloudera server API. Default is 7180. Service Views Optional features of Cloudera are called Cloudera Services. These features are the core components, or services that are managed by Cloudera. Services include HBase, HDFS, Hive, Hue, Impala, KSIndexer, Oozie, Solr, Spark, Zookeeper, Yarn, and Kafka. Each of these services has their own rich set of metrics. By default, all services are selected. If checked, service will be monitored. Cloudera also provides Cluster and Host metrics which can be optionally collected. If there are one or more clusters or hosts in the system, they will be automatically detected and collected. If you were collecting metrics for a service, and then unchecked that Cloudera service, the existing hosts and metrics stored in the GroundWork server will be deleted. After entering the Cloudera server parameters, click the Test button to test the connection. A dialog will be displayed with either a success message or, if the server cannot be contacted, an error message will be displayed with information describing why the connection failed. When a successful connection is made, the Connection Status button will change to green. After the remote server parameters have been entered, click Save in the upper right corner to save and write the entries to an XML file in the GroundWork server /usr/local/groundwork/conifg/cloudhub directory. The Cloud Hub connector is assigned an agent ID and that in turn becomes a record locator in Foundation when you begin monitoring. Next, validate both server configurations by selecting the Test buttons which will check if the connections are accessible with the given credentials. A dialog will be displayed with either a success message or, if the server cannot be contacted, an error message will be displayed with information describing why the connection failed. When a successful connection is made, the Connection Status buttons will change to green. After the credentials have been validated select the Metrics link (top navigation) to start customizing metrics for the connection. Once you are satisfied with your configuration settings, click Save, then click the Metrics link in the navigation bar to start customizing your metrics for this connection. 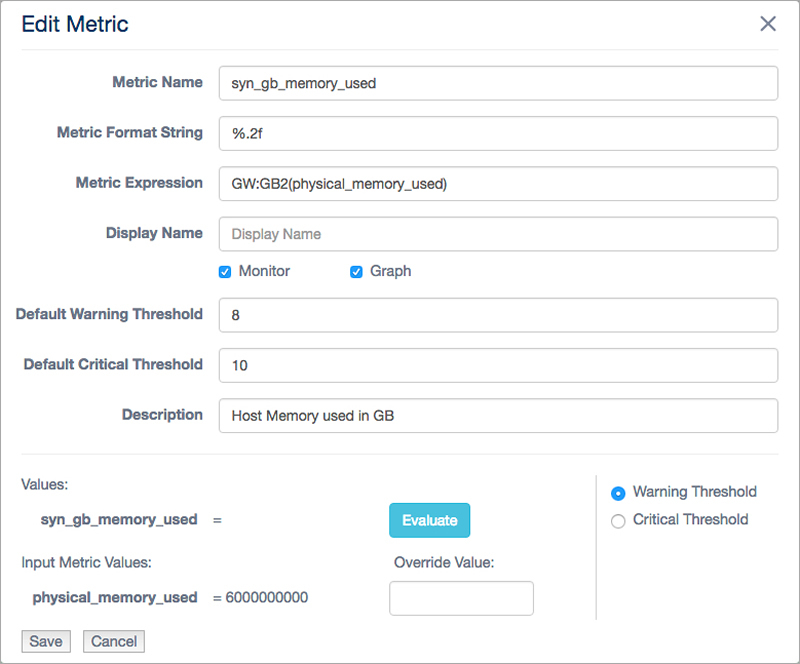 The section below describes how to configure Cloudera metrics. When you are satisfied with the metric selections click Save to commit your changes to Cloud Hub. Click Home to return to the main Cloud Hub panel. Click START for the specific connector to begin the discovery and data collection process. 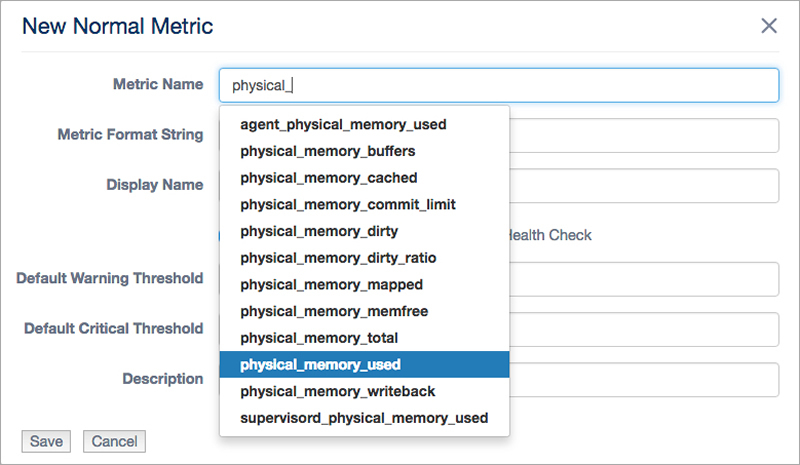 The Cloudera Metrics page is where you customize the lists of metrics being gathered for a connection. 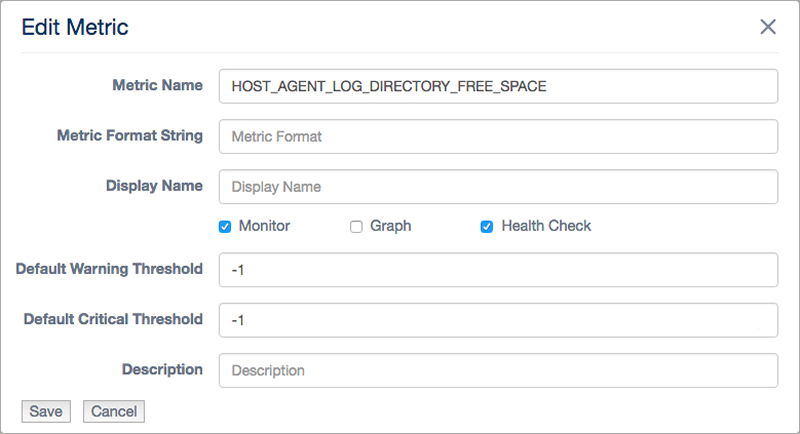 Out of the box, a complete list of metrics is provided for clusters, hosts, and Cloudera services. You can customize these metric lists by adding metrics to the list, deleting metrics, as well as creating calculated metric fields called Synthetic metrics. A metric is considered inactive if it is not monitored, (see section on Synthetics below). Each row in the grid represents a metric. Metrics can be added, edited or deleted. You can directly edit metrics in the grid or use the advanced metric dialog by clicking the Add or Edit buttons and then configuring all properties of a metric in the dialog. When editing metrics in the grid directly, you will need to cllick the Save button in the top navigation to commit your changes to Cloud Hub. The UI will know if you made changes and remind you to save your changes if you forgot. Monitor? Check this if you want to enable monitoring of this metric. Metric Name The exact Cloudera metric name or a Cloudera metric expression. This field is read-only. Click the Edit button to modify it. Display Name Overrides the metric name and stores the metric in GroundWork as a service with this name. Warning Threshold Metric value that will trigger a GroundWork Warning alert. Critical Threshold Metric value that will trigger a GroundWork Critical alert. Leaving the threshold fields blank will disable threshold triggers. Metrics come in two flavors: they can either be Normal or Synthetic metrics. In this example, we have a Host metric named load_5. This is the unique name of the metric in Cloudera. In the Display field, we renamed this metric to HostLoad5Minute. Renaming metrics is an optional feature. In this case, we renamed load_5 to have a more descriptive metric name displayed in the GroundWork Status viewer. We recommend filling out the description field to describe the metric. This metric represents the Host CPU Load averaged over 5 minutes. We have also setup warning and critical thresholds. Note that the metric will be monitored and graphed. Note that we never use dashes in metric names, only underscores. This is because dashes are not valid variable names in a Cloudera or synthetic expression. As you type into the Metric Name field, the valid names of metrics available are automatically auto-suggested. This ensures that you use a valid Cloudera metric. Normal metrics can also be computed. They differ from Synthetic metrics in that the value of the metric is an expression, and it is computed on the Cloudera server, not by Cloud Hub. When working with computed metrics, make sure to include the AS clause (alias) in your computed expression. Aliases are required on computed metrics. Additionally, the metric Display name must match the alias. See the section below on Example Formatting for more examples. As you type into the Metric Name field, the valid names of metrics available are automatically auto-suggested. 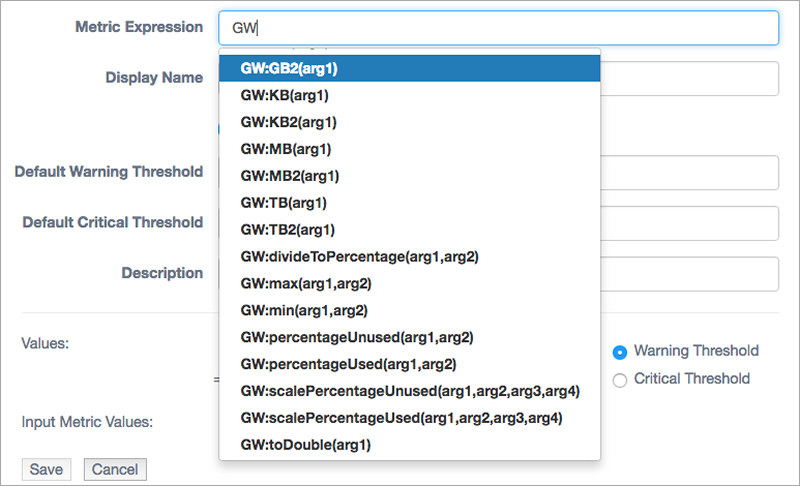 This ensures that you use a valid Cloudera metric name in your expression. Health Check metrics are a special type of metric that only report back Health Check status. These metrics do not have numeric values, but instead have health check statuses that map to GroundWork statuses. Health Check metrics are flagged with the Health Check checkbox. As you type into the Metric Name field, the valid names of Health Check metrics available are automatically auto-suggested. 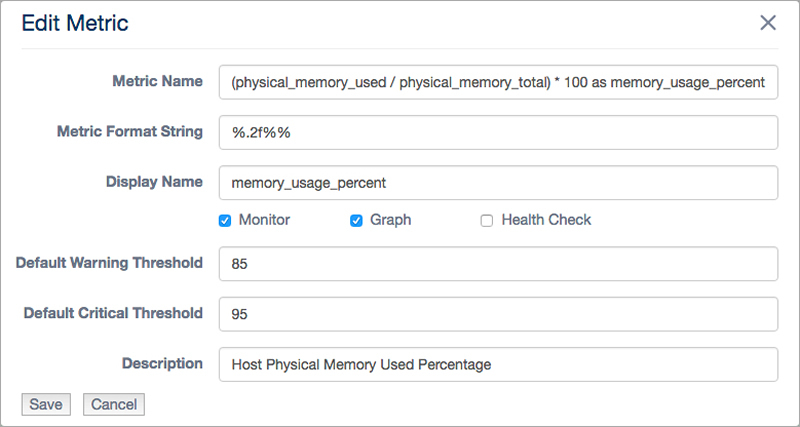 This ensures that you use a valid Cloudera Health Check metric. See the section below on Health Check Status Mappings for the complete list of health check status mappings. Configuration metrics are only used in synthetic computations. They are not reported back to the GroundWork server. To create a configuration metric, simply do not check the Monitor checkbox. Configuration metrics are used in synthetic calculations, where the value is required, for example to perform a to megabyte or to gigabyte conversion, but you do not want to report back the byte value to the GroundWork server. The Monitor check box is left unchecked. Note that we still use thresholds, as they are useful in the Synthetic Expression evaluator. A Synthetic metric is a metric that is computed by Cloud Hub. It has one additional field, expression, that normal metrics do not have. The synthetic metric name is a simple metric name conforming to the GroundWork service name requirements. No spaces are allowed. By convention, we name synthetic metrics with the prefix syn_. As you type into the Metric Expression field, the valid names of metrics available are automatically auto-suggested. This ensures that you use a valid Cloudera metric name in your expression. Synthetic expressions are limited to the Normal metrics defined for the current group. Additionally, the auto-suggest feature displays all GroundWork functions. Example expression with division and multiplier operators, parenthesis for grouping, and data conversion of integers to double values. The two normal Host metrics are fd_open and fd_max. Note that both normal metrics must be defined for this group. Other synthetic metrics cannot be included in a synthetic expression. The data types of Cloudera Metrics are typically floating point (double) values for any measurements. For counters, like the example above, are usually integers or longs. Consult the Cloud Hub documentation for a complete reference guide to metrics. Type conversion is supported as GroundWork functions for both floating point and integer numbers. See the section below GroundWork Functions for a complete list. The synthetics dialog has an expression evaluator to try out and test your expressions before saving them. The evaluator is displayed at the bottom of the dialog. Each variable in the expression is evaluated based on the check boxes. The fd_max and fd_open metric fields are predefined with warning threshold values of 800 and 400. Clicking Evaluate yields the formatted output: 50.00% used. The fd_max and fd_open metric fields are entered with values of 2000 and 1500. Clicking Evaluate yields the formatted output: 75.00% used. 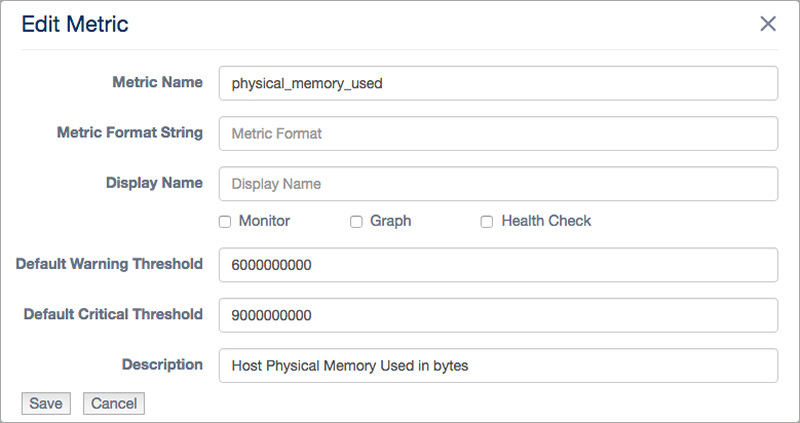 Cloudera computed (normal) metrics are calculated in the Cloudera server. Here are some examples of Cloudera computed metrics. dt(metric) - Derivative with negative values. The change of the underlying metric expression, per second. dt0(metric) - Derivative where negative values are skipped (useful for dealing with counter resets). The change of the underlying metric expression, per second. getHostFact(string factName, double defaultValue) - Retrieves a fact about a host. This example divides the results of dt(total_cpu_user) by the current number of cores for each host. If the number of cores cannot be determined, the default "2" will be used. getHostFact currently supports one fact, numCores. Example 3: Cloud Hub computes the percentage of memory used with the divideToPercentage function. Note this function returns an integer. This Function provides percentage usage synthetic values. Calculates the usage percentage for a given used metric and a corresponding available metric. Both the used metric and available metric can be scaled by corresponding scale factor parameters. This Function provides percentage unused/free synthetic values. Calculates the unused(free) percentage for a given unused metric and a corresponding available metric. Both the unused metric and available metric can be scaled by corresponding scale factor parameters. When entering a metric name in the Metric Name field, metrics are auto-discovered. As you type into the Metric name field, the names of metrics will be auto-suggested. Cloudera has thousands of metrics. The auto-discovery feature can be very useful in finding the right metric. 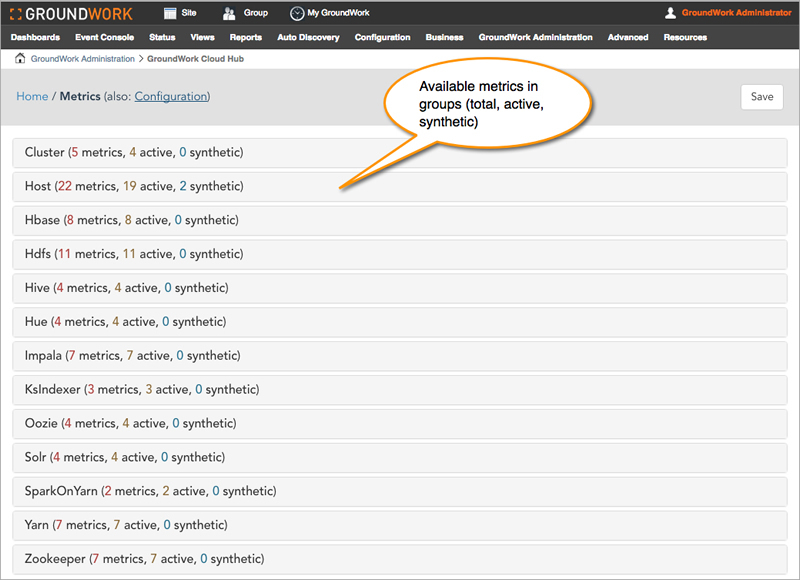 When entering a synthetic expression, configured metrics will be auto-suggested. As you type into the Metric name field, the names of metrics will be auto-suggested.